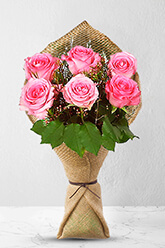 Composed with six, sensuous, long stemmed pink Roses and delicate greenery this exquisite bouquet makes the perfect gift to express your subtle sentiments of love. If you want to express them loud and clear, send at least twice the amount of deep red roses.Vase not included however for this sweet bouquet of stunning roses, we recommend a Premium Vase as the complementary choice. i’m satisfied with flowers very much. Delivery time would be better a bit earlier.